Silver “Day Of” Package- Perfect for the couple who has their wedding day planned but needs a professional to step in to implement the details and coordinate their wedding weekend. This package begins one month prior to the wedding date. Gold Package- Our full service wedding planning package allows our clients to relax and enjoy the journey of getting married. This package is perfect for the couple who needs guidance in making all of their dreams a reality with vendor referrals, timelines, checklists, budget tracking, and more. Platinum Package- price based on event budget For the couple in need of a planner, florist, and event decorator. The package includes full service wedding planning, 40-60% off the cost of your flowers, and the use of Elle Events décor items including linens, chair covers, sashes, fabric draping, vases, candles, and much, much more at no additional charge! Design Service Package- Our design package is for the couple who already has their wedding planned, but needs someone to add the finishing details that add a wow factor for your guests. 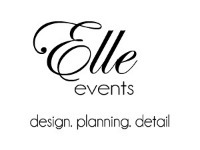 Elle Events can handle every detail of your wedding décor ranging from tent decoration and centerpieces to linens and flowers. This package includes wholesale costs on decorations including linens, candles, vases, centerpieces, uplighting, fabric draping, and more. Packages starting at $750. Contact us for further information about pricing and package details.